After a long break the World Series is back this weekend for the third round of this year’s five tournament series, and the World Series’ second visit to Kitakyushu in Japan. 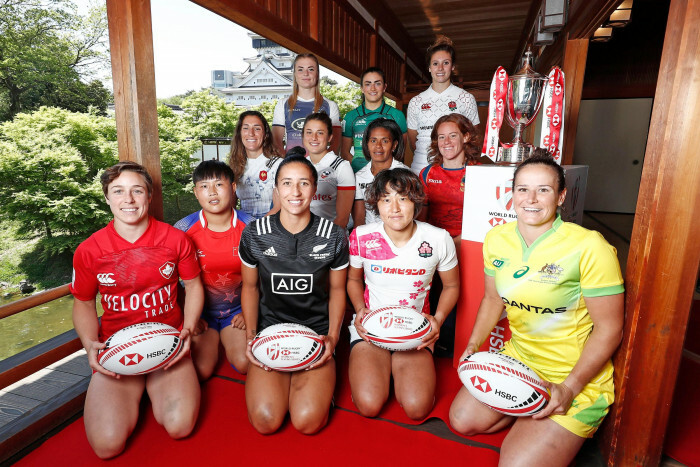 The World Series may have had a long break since Sydney, but five of the teams in Kitakyushu come into the tournament fresh from last week’s Commonwealth Games, and one from the World Series Qualifier in Hong Kong just two weeks ago. It will be interesting to see what the result of this varied preparation will be, but when it comes to injury absences it is Australia who seem to have suffered the most. New coach John Manenti has had to call up three players into this squad who took no part in Australia’s silver medal party. Lauren Brown, Page McGregor and Yasmin Meakes have the unenviable job of filling the shoes of Charlotte Caslick, Elia Green and Sharni Williams. With the added massive disappointment of the extra-time defeat in the Gold Coast, turning his new team around will tough for the new coach. "The team has been through a range of mixed emotions over the last 48 hours after that thrilling final against New Zealand but fortunately, we don’t have to wait to get back on the park," he said. “Our whole focus will be on this next challenge ahead of us and such is the nature of Rugby Sevens you have to get back up very quickly for the next round of the HSBC Sevens World Series. “We have some new players coming into the squad who will bring some enthusiasm and energy to the team with Page, Yasmin and Lauren now getting their opportunity. Sharni’s going to have further scans to see the extent of the injury to her ankle and Ellia is one that we need to manage due to the nature of her original knee injury." If Australia are having to build themselves back up, New Zealand perhaps have the opposite problem of getting back into focus after their golden performance last Sunday. Huia Harding is the only player in the squad who was not at the Gold Coast, replacing Alena Saili, but the big names are all fit and raring to go. Centre Niall Williams, said the defending Kitakyushu champions were still enjoying the gold-medal vibe, but that their focus had promptly shifted onto the next job at hand. "The girls are still 'vibing,' but we know that we've got another job to do right now," Williams said. "We're running on adrenaline, we're running on all those extra trainings we did back home, we're running on our families sitting in the crowd, and just passion. "It's easy to say that we don't have to do a massive prep for the tournament, but in saying that, our recovery is going to be quite critical this time around. I guess the main focus will be trying to get the body to as near as 100 percent as we can before we kick off on Saturday." Another team on a high after the Gold Coast will be England, whose performances this year had been below the standard expected off until they reached the Commonwealth Games where they finished as bronze medalists. They do not come into this tournament unscathed, however, with both Emily Scarratt and Megan Jones absent, replaced by Vicky Fleetwood and Millie Wood. Coach James Bailey said: “What the team achieved in the Commonwealth Games was outstanding and showed how far the programme has come in a very short period of time. I’m really proud, especially with how the team showed their values throughout and the fight they showed from game one, all the way through to the bronze medal match. It sets us up for an exciting future." England will meet Canada – who they beat for bronze - in their second match in Japan, but the plus for Canada is that they come into this will no injury after-effects from Commonwealths. Canada were beaten in the last minute in the final in Japan last year, and can be expected to bounce back strongly from what will have been a disappointing outcome last weekend. Fiji – also fresh from their fifth place in the Commonwealth games - are also in the same pool as England and Canada, and are also (like Canada) largely unchanged from last weekend where their fate was decided in a scrappy opening game with England that they could have won. This weekend they open against Canada, and also face Russia in a tough pool that they must claw their way out of if they are to stand any chance of reaching the heights achieved last year. The other team in recent action was this round’s guest team – China, who impressed as winners of the qualifier in Hong Kong two weeks ago. They are almost unchanged from that tournament – 20 year-old Xiaoyan Xu being replaced by 24 yar-old Xueqin Tong – despite which China will still be the youngest team in Japan (with an average age of just over 22 they will be about a month younger overall than Japan). China’s unpredictability stems from their tendency to select a team based on their current provincial champions, rather than a truly national side. While in theory this does create a large base of players with international, in practice it means that China never seem to quite live up to their potential.. Their only previous appearance as a core team resulted in immediate relegation. Their strong performance in Hong Kong was also put in perspective a little by beaten finalists South Africa failing to record a win in Gold Coast. The six teams who have been largely inactive prior to this tournament is headed by Russia, the fourth team in the otherwise all-Commonwealth Pool C. Coming straight out of the Russian winter does not always result in the best of performances for this team, but they have been by far Europe’s top team in this series and it’s hard to see how that will end. The crucial game may well be the opener with England – win that (and on form they will start as favourites) and Russia should be on their way to another quarter. France welcome back three players from their victorious Six Nations squad - Jade Le Pesq, Caroline Drouin and Marjorie Mayans – and it will be interesting to see how these three cope with the swap from 15s to 7s that many players and teams struggle with. Lying in fifth place with two solid quarter-final behind them the biggest threat will be the United States, who they meet at the start of the tournament. That said France normally perform well against New Zealand so with the addition of a good win over Japan, a place in the last eight seems very likely. The United States themselves have to recover from a disappointing eighth place in in Sydney after a great start in Dubai. Coach Richie Walker brings in more experience this time with Abby Gustaitis, Saskia Morgan, Becca Kosko, and Tia Blythe been replaced by Kate Zachary, Kristen Thomas, Kelly Griffin, and Neariah Persinger. Only Persinger is a new face. A crossover athlete who first made her name as a swimmer before switching to rugby. "With the long break between the Australia stop and the Japan stop we were very lucky that we got to play Australia in a four-match series in Las Vegas," Walker said. "We also got to play Canada and Japan at the training center which was very helpful for us." "We have a very tough pool and we need to be at our best to qualify for the Cup Quarters. New Zealand is one of the best teams in the world that very rarely makes mistakes so we have to make even less. They will also be coming from the Commonwealth Games which I think will benefit those sides. "France is one of the top nations and proved very hard for us to beat as they are fast and physical and we have to match that. Japan is the host nation and—no matter who it is—host nations generally step up, so we have our work cut out for us." Japan complete the pool. Playing at home is a mixed blessing, but Japan need all the help they can to avoid immediate relegation following on from last year’s promotion, but it is very hard to see them upsetting any of the other teams in their pool. What will be interesting will be their almost inevitable battle with China on day two to see who is the leading team in Asia. Which just leaves Pool A where Australia and China are joined by Ireland and Spain. Spain will be hoping to continue with what has been their best-ever start to a World Series, with back-to-back quarter finals, and perhaps only Ireland stand in their way of achieving that. With such an experienced core to the team hopes will be high. Finally Ireland welcome back four players from the Six Nations - Ashleigh Baxter, Katie Fitzhenry, Louise Galvin and Hannah Tyrrell – and as with France the key to Ireland’s success may he how this quartet readjusts to sevens. Speaking about the Japanese leg coach Stan McDowell said: "Kitakyushu is set to be an exciting tournament for us. Having finished seventh in Sydney, it's about looking to progress on so we'll be looking to put in three good performances on day 1 to set us up for a good day 2. "Several of the sides at the tournament will have competed at the Commonwealth Games so they will be coming into Japan with good game-time under their belts. It's about us being prepared and getting off to a good start in our opening game against Spain."